Images taken in 1983, 1999 and 2006 show the common motion of the very low-mass binary pair. A newlyspotted pair of tiny stars that holds the record for the longest-distancecelestial embrace is bound by only a thread of gravity and might one day breakup. The starsare separated by 5,100 astronomical units (AU), where one AU is the distancebetween the Earth and Sun. 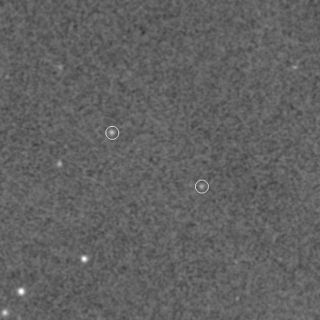 Astronomers have dubbed the pair the Hang-looseBinary. The previous record holder for long-distance binary stars was theKoenigstuhl 1AB system, in which the stars are separated by about 1,800 AU. The weakgravitational tether binding the two stars in the Hang-loose Binary results inan orbital dance so slow that one orbit takes 500,000 years to complete. On ahuman scale, this system would appear as two baseballs orbiting each otherabout 200 miles (300 kilometers) apart. Theresearch, published in the April 10 issue of the Astrophysical JournalLetters, throws a wrench in star-formationmodels, which would not predict that such a low-mass, wide binary setupcould form and remain stable. Only about a half dozen very-low mass binarysystems with separations greater than 50 AU are known. Manyunanswered questions still plague the finding, including the age of the objectsand whether they should be classified as so-called red dwarfs or less-massivebrown dwarfs. Astronomersled by ?tienne Artigau of the GeminiObservatory in Chile discovered the system by comparing the locations of thestars from archival data collected 16 years apart. Observations with the CerroTololo 1.5-meter telescope confirmed the two stars were indeed travelingthrough space together about 200 light-years from Earth in the southernconstellation Phoenix. Using an infraredspectrograph on the Gemini South telescope, the team estimated the objectsreach temperatures of about 4,000 degrees Fahrenheit (2,200 degrees Celsius). Each objecthas a mass less than 100 times that of Jupiter and could be either red dwarfs,which are the most common type of star, or brown dwarfs,which are celestial objects that are bigger than the biggest planet but smallerthan the smallest star. Artigaucalls the new binary discovery surprising and "disturbing." Astronomersestimate that two out of every three stars in the Milky Way is a member of abinary or othermultiple-star system. The onlyother known binaries with such a lengthy separation are substantially moremassive. That's because the more mass a star packs, the greater its tug onother objects, hence the stronger gravitational bond between the couple. Celestialduos like the recently discovered one belong to a class of very low massbinaries. How these systems form and maintain their gravitational embrace is amystery. The same process thought to spit out lightweight binaries should alsodestroy them. "To formstars below about 0.3 or 0.2 times the mass of the Sun, you need somerelatively violent phenomenon, so the core [of the protostar] doesn't have thetime to accumulate the mass to be heavier," Artigau told SPACE.com. "Ifyou have a phenomenon like that you don't expect weakly bound systems tosurvive." Whether theHang-loose binary contains red dwarfs or brown dwarfs has bearing on thesystem's age. The binary could be a billion of years, but that is uncertainbecause it is nestled amidst a group of much younger stars, called theTucana/Horologium (TH) association. Its members are about 30-million-years old. If theHang-loose pair is a member of the TH association, the binary pair would haveto be much younger, indicating that rather than red dwarfs the objects are lessmassive brown dwarfs. Nailingdown the binary's age would help astronomers predict how long the embrace couldlast. "Unlike red dwarfs, these brown dwarfs wouldn't have enough mass toignite hydrogen into helium at their cores, so they are destined to have theirweak embrace disturbed more easily (and quickly) while they slowly cool, andfade from sight," said study team member David Lafreni?re of the University ofMontreal. In thatcase, all it would take is "a star that passes closer to one of these objectsand just breaks the pair," Artigau said.